Mystery objects in Chinese sky after claims moon rover "killed by UFO"
When the Chinese moon rover Jade Rabbit broke down after travelling a mere 60 feet across the moon’s surface, scientists and engineers knew who to blame: aliens. The government announced that it had fallen victim to extreme cold - but some state-run magazines and TV shows offered another explanation, with the support of some scientists, and even members of the military. More UFO sightings have followed - including a “head-sized” ball of light which flew into a house in Qihe County, according to Shandong Qilu radio. In China, the dictatorial government legalised discussion of the subject in 1979 - and China’s approach is rather different from the West’s. State-run TV stations and newspapers regularly report UFO stories - and take the stories seriously. Some Chinese UFO societies require members to have a degree-level qualification and published scientific articles before they can join. The Journal of UFO Research was launched with the support of scientists - and had a circulation of 40,000 at its peak, higher than any such publication in the West. The mysterious “death” of Jade Rabbit has ignited a new wave of UFO frenzy. On some of China’s popular UFO sites, users described an “enormous object” near the moon before Jade Rabbit ceased to function. Watson says that his own book on UFOs is now to be published in China, as fears over mysterious rover-killing UFOs grip the nation. 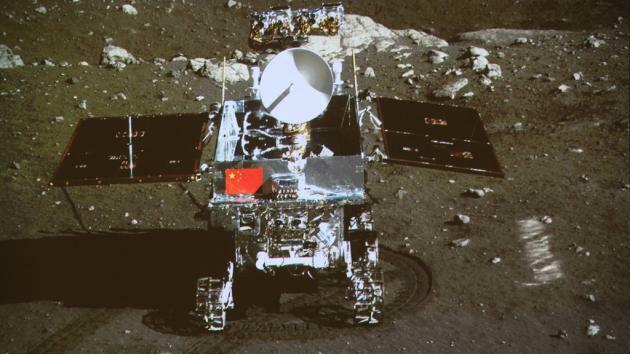 “There has been a huge interest in this topic in China since the 1980s and the launch of the Jade Rabbit inspired a renewed interest in all space-related topics. At the moment China has 60 UFO researchers scattered throughout the country ready to investigate any alien encounters,” Watson says. Like the Americans, the Chinese see military potential in any UFO encounters - according to the New York Times, the Chinese Air Force attends important UFO meetings. ''If our conditions for membership weren't so strict, we'd have millions of members by now,'' says Sun Shili, a retired Foreign Ministry official who runs Beijing’s official state-endorsed UFO society. Members have to have degrees in science and engineering. Chinese scientists are more open to the idea that extraterrestrials may be involved in incidents than their Western counterparts would ever be. Yang Ji, a research fellow at Purple Mountain Observatory of the Chinese Academy of Sciences said when investigating a cave filled with odd metal objects that he would investigate the idea they came from beyond Earth. "Scientific means must be employed to prove whether the ET hypothesis is true," he said. Watson says that UFO sightings in China involved craft similar to those seen in the West - a fact probably pleasing to UFOlogists. “UFO sightings in China are very similar to those in the rest of the World. There are sightings of ‘flying boats’ recorded in ancient documents and there have been several waves of sightings in recent years and they have all types of close encounters from lights in the sky to alien abductions,” he says.